How Prepared is Your Kitchen for a Fire Emergency? Restaurant Fire Suppression Systems have become necessity to meet many insurance requirements and local ordinances. Beyond that, fire suppression can often make the difference between an out of control grease fire with all the harm that can bring, versus an easily controlled and easily extinguished inconvenience. The factory-trained professional technicians at AAA Fire Protection Services both install and service Restaurant Fire Suppression Systems. 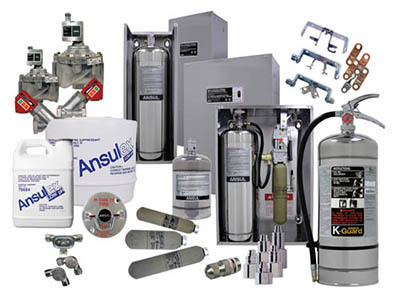 Perhaps you have heard of fire suppression systems and are unsure of what they are and how they work. At their simplest, the systems are usually part of a hood with a series of nozzles. The nozzles are set such that they overlap for complete coverage and, more importantly, to keep the fire from spreading. 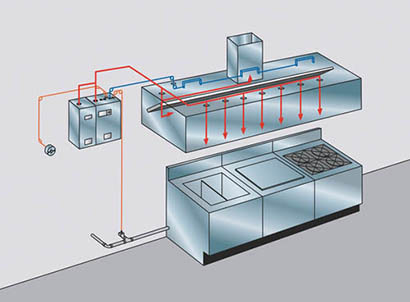 Restaurant Fire Suppression Systems both “knock down” the flames as well as cool the grease. They may also generate water vapor that makes certain the grease does not re-heat and re-ignite. When AAA Fire Protection Services installs a new system, we don’t use a “one-size-fits-all” approach. We will recommend a system tailor-made to your particular needs. We are a very honest and ethical family-run company in business for more than 40 years. We will never sell you what you don’t need. At the same time, we would never recommend a Restaurant Fire Suppression System that is a budget brand that could fail to do its important function.